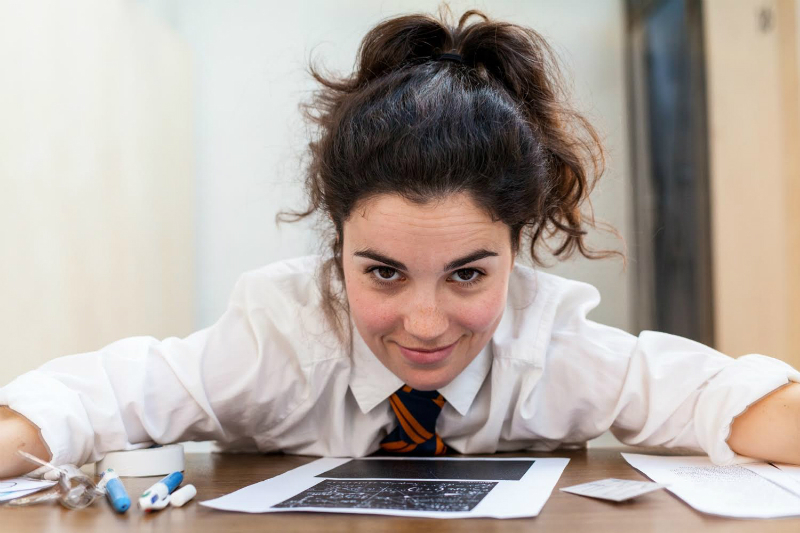 The Quantum Physics of My Heart is a delightful one-woman show inviting the whole audience to take a trip down memory lane to reminisce about the 1990s-2000s, as well as the timeless and universal challenges of being a teenager. Writer and actor Amy Tobias is a charming host for the evening, greeting her audience with “experiment bags”, which we are invited to make use of at various points during the performance. Her wide-eyed enthusiasm quickly wins us over, which is vital in a show that repeatedly summons up unsuspecting members of the audience to play characters from Amy’s young adulthood, from teen crush to a creepy older neighbour. Accompanied by a slick PowerPoint presentation and a killer ’90s soundtrack, Amy relates four episodes from her life between the ages of 13 and 16: her inappropriate crush on a teacher, a hilarious re-enactment of a house party which gets crashed by a local gang of thugs, an attempt at a romantic trip to Salcombe, and her first babysitting job. Along the way, with the help of Jurassic Park, Destiny’s Child, a packet of baking powder and a straw poll on the best pop star of the late ’90s, she tries to use science to explain the notoriously unpredictable, illogical process of growing up. She can’t, of course, and we are all invited to participate in a moving epilogue in which Amy starts to realise there are no scientific rules governing human behaviour and emotions, and adults don’t have it all figured out either. While Tobias is an engaging and hugely likeable narrator, it’s sometimes a stretch to believe a city-living, 16 year old is as naïve and innocent as the Amy of the play is portrayed. But you’ll probably be too busy trying to remember all the words to MMMBop and blow a bubble with your Hubba Bubba to really care. If you can remember being a teenager in the 90s, you will enjoy this show. Or if you can just remember being a teenager, you will enjoy this show. The Quantum Physics of My Heart runs through 25 February.